We see a lot of classical dance in New York, and then a company like India's Nrityagram Dance Ensemble returns to town and reminds us how much we have to learn. For me, the beauty of a classical vocabulary in part lies in the codification of movement. (Ballet in particular, but it also applies to modern choreographers like Paul Taylor or Martha Graham.) These defined languages become second nature, enough to essentially become invisible—beholden to the various forms they take, or free to put ideas first. It's much like learning a language fluently—it becomes a priori; it transcends consciousness. But it's also a complication while watching Nrityagram, whose Odissi vocabulary is tantalizing but opaque to me, unschooled in its endless specifics. 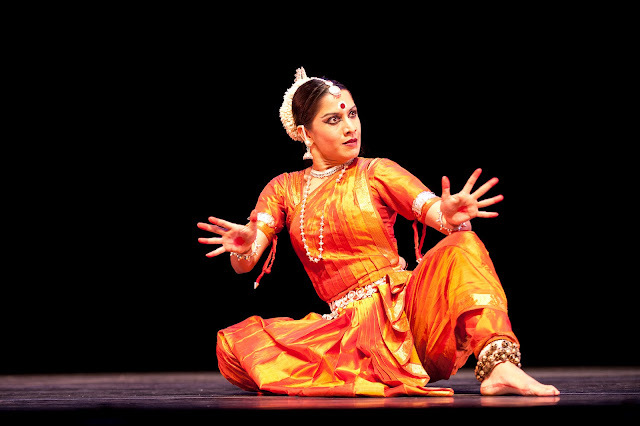 Nrityagram's three dancers (Surupa Sen, Bijayini Satpathy, and Pavithra Reddy) collaborate on the New York premiere of Samhara, the Joyce program through Mar 25, with Chitrasena Dance Company of Sri Lanka's two dancers (Thaji Dias and Mithilani Munasingha). Nrityagram's musicians, joined by a drummer from Chitrasena, play live onstage. It's obvious there is so much to learn about specific gestures—not so much the descriptive ones, which find counterparts in sign language, but the work that's constantly done by the fingers, the head angle, the eyes, the mouth, the lower body, and its relation to the upper body. It seems infinitesmal, fractal-like, pulling us close to whisper a gesture, and letting us zoom back out to take in the bigger picture. Without the knowledge to unlock the constantly streaming storytelling, there are still plentiful gifts for the viewer. Begin with the surface, where luxuriant details abound—the hothouse flower-hued silk costumes so elaborately pleated, layered, and tailored; the trimmings, such as tassles, hair ornaments, jewelry, and makeup. The technique—rock solid balances done with ease; the coordination of every body part moving separately; the complex rhythms and syncopations. In the finale, the dancers uncork their respective strengths in stage crossings and ensemble sections. The lithe Chitrasena dancers eat up space and even leap, in contrast to the powerful groundedness of Nrityagram's more contained, theatrical Odissi style. And in a bit of showmanship, each performer's name is called as they take deserved bows before the wildly enthusiastic audience.